Described from finds in Breton megalithic art this symbol is named ‘crook’ in literature (e.g. ). This symbol can be found in a number of passage tombs in Brittany, including Mané Hroeck, Mané Rutual, Mané Lud, Gavrinis. 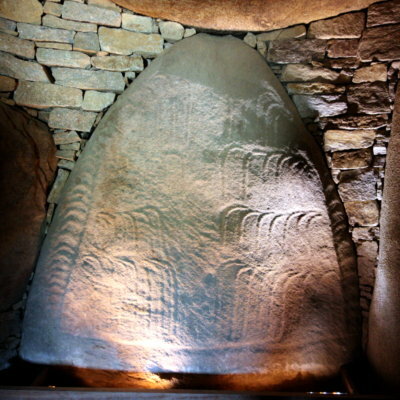 The backstone of the passage tomb ‘Table des Marchands’ in Locmariaquer shows a number of this symbol. Further the capstone shows a crook next to an axe carving. The initial name ‘crook’ was given to this symbol, since it resembles the shape of a shepherd’s crook. In Egypt this was a symbol of power and it was also adopted by Christianity (bishop’s crook). However, recently this symbol is thought to be a depiction of a weapon or projectile, similar to a boomerang. This seems to be supported by the depiction of the symbol next to a hafted axe on the capstone of the Table des Marchands. In this case the ‘crook’ would been a symbol of power like the axe depictions. E. S. Twohig, The megalithic art of western europe, Clarendon Pr, 1981.